I may be somewhat overwhelmed after absorbing this exhibition of such extraordinary richness, historical interest and crushingly lovely detail, but as I wander from the Royal Academy's Three Emperors show into cold, dark late-afternoon London, I am almost struck dumb with awe. I can barely write, such will be the chasm between these words and those works. I've never witnessed anything like it. I half suspect that London has never seen an exhibition of such sheer craft before, even given this world city's position as a major cultural centre stretching back to the time much of this work emerges from. The skill, scale and detail of these works is almost beyond comprehension. One room of these national treasures, many of which have never been sent abroad from the Palace Museum in Beijing before, would have been a treat in itself. However, we have twelve packed rooms of artworks to navigate, across numerous media. It's a wondrous, thoroughly inspirational experience. The works induce a studious, rapt gaze so it's worth finding a time when tourist numbers will be low. The otherwise excellent catalogue can only fail to represent the physical beauty of the exhibition, given that photographic reproductions on the page simply cannot do justice to works almost exclusively painted on to silk, with its delicate weave often revealing shimmering patterns when viewed from different angles. Equally, the scale of many of the pieces - some of the scrolls were originally 60 metres long, and even unfurled to a detail take the full length of some of the Academy's galleries - require the ability to peer at the detail of individually painted leaves in trees and the expression on a courtier's face and then stand back to take in the full view of the Yangzi river or walled city of Ghuazou. These dizzying shifts of scale, from near-microscopic paintwork of ten-thousand 'long-life' (shou) characters on a jar signifying eternal life through to one of the actual throne rooms of the Forbidden City, are perhaps the single most enlightening aspect of the entire exhibition. After the entrance of embroidered silk costume and full-size portraits depicting the three Emperors themselves - the Kangxi Emperor (1662-1722), the Yhongzheng Emperor (1722-1735) and the Qianlong Emperor (1736-1795) - the next room of work produced by artists of the Qing dynasty court had the greatest effect on me, dominated by tall vertical paintings arranged around huge horizontal scrolls depicting events such as 'The Qianlong Emperor's Southern Inspection Tour, Scroll Twelve: Return to the Palace' by Xu Yang and assistants (1764-70) or 'The Kangxi Emperor's Southern Inspection Tour, Scroll Eleven: Nanjing to Jinshan', by Wang Hui and assistants (1691-98). The scroll form is fascinating, enabling both a diagrammatic representation of the city as well as a literally unfolding narrative. It conveys architectural and geographic detail, as well as historical events and portrayal of ritual, moving across mist-shrouded, forested islands with jade-like outcrops of rock, into the rigorous geometry of the Forbidden City, realistically depicted in great detail by artists living inside the palace. The series, 'Portraits of the Yongzheng Emperor Enjoying Himself throughout the Twelve Months', conveys both a vivid sense of place - somehow other-worldly and everyday at once - whilst depicting a distinct cultural practice. Historically revealing and aesthetically powerful. Given his own research into multi-perspectival maps, my friend Jack Schulze will particularly enjoy the twin-perspective city view of Beijing from 1767, by Xu Yang, 'A Scene Described in the Qianlong Emperor's Poem 'Bird's-Eye View of the Capital'. It's a beautiful piece of representation, featuring the more traditional axonometric perspective, from a viewpoint high above the city, morphing into a European-influenced 'vanishing-point' linear perspective. As well as being formally fascinating from a design perspective, it's also a breathtakingly gorgeous depiction of the snow-covered city at the lunar New Year, full of architectural detail. In this practice of jiehua, or architectural painting, from this period, we see an intriguing compromise emerging from the constraints imposed by fusing these two modes of perspective, with buildings often fading out into mist at the top of the painting, hiding the otherwise misaligned vanishing points. The beauty of this jiehua can also be conveyed by simply reading the names given to spaces in these cities: "The Room of the Ink Clouds in the Hall of Mental Cultivation"; "Hall of Supreme Harmony, Forbidden City"; "Hall for Worshipping Ancestors"; "Palace of Earthly Tranquility"; "Mountain Villa to Escape the Heat"; "The Gate of the Mid-day Peace" and so on. Elsewhere, I was also taken with twin sets of sixteen bells (bianzhong) and sixteen sonorous stones (bianqing), hanging from 3.5 metre-tall stands constructed from gilt bronze, gold-lacquered wood and nephrite (jade) - the sound of which is tantalisingly absent. The catalogue mentions that the Kangxi Emperor was "intrigued by European musical pitch, and commissioned a major work on Chinese pitch as a result of this exposure." I suppose the only way of enriching this exhibition would be to include some other relevant sensory context, such as the sound of the language and music of the time or the smell of sandalwood from the incense burners, but much of this would either be speculation at best or would appear gimmicky if not articulated extremely carefully indeed, in what is actually an appropriately restrained bit of exhibition design. Historical context is laced throughout the displays, particularly focusing on the expansionist nature of the Qing dynasty. 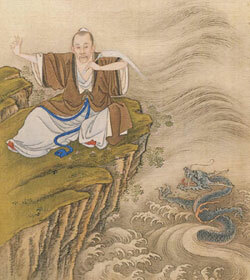 We see many examples of zhong xi he bi - a combination of Chinese and Western artistic techniques, practiced most successfully by the 'adopted' Jesuit artist Giuseppe Castiglione. Fascinating collisions of technique, aesthetic, philosophy and ritual. Technology too, as scientific instrumentation from Europe was explored thoroughly in workshops around the Palace. Some revealing maps of the world from the Southern perspective are on display here, alongside many clocks and instruments for celestial observation. A small set of dark wooden geometric shapes for exploring Western mathematics are carved so precisely it's as if they are barely physical at all, existing only as formulae, vectors possessing physical presence. The fusion with Buddhist tradition is equally fascinating. As with other successful empires, conquering territories meant infusing their existing ritual with native cultural practices, and there is much evidence of hybridised cultural production as a result. For instance, the jade sculptures in a room devoted to a religious practice hovering around Tibetan Buddhism, Manchu shamanism, Daoism and Confucian rituals of state - such as the Set of Seven Royal Treasures: Golden Wheel, Horse, Elephant, Loyal General, Able Minister, Woman, Divine Pearls - with which, according to Indian myth, the possessor would be aided in ruling his domain. And of course, the calligraphy, not only in 'traditional Chinese' as practiced by the Emperors themselves, documenting ancient poetry, but often in a variety of scripts. There are numerous Imperial documents in Manchu and Mongolian scripts, somewhat Arabic in appearance though read from left-to-right, converging alongside Chinese scripts read from right-to-left. In one extraordinary document, Latin alongside Chinese and Manchu, as an admonishing 'memo' to the Pope declaring the loyalty of sixteen Jesuit missionaries to the Kangxi Emperor. Other areas of fascination remain in mind, over and above the general wealth of exhibits. I was captured throughout by the graphic flourishes that will absorb other visual designers, from the various examples of tessellated patterns, to the silken rainbow curves in costume depicting waves merging into symbolic icons, abstract and figurative. Equally, the Emperor's seals, embodied in lacquered boxes and deployed as innately authoritative red graphic devices. A more expected style, the traditional monochrome ink landscapes of the educated elite - the literati - are all the more alluring 'in person', often combining bold composition with delicate brushwork. This work of the 'literati', produced outside the Court, often appeared to comprise works of starkly quiet, coded rebellion, infused with symbolic patterns mourning the lost dynasty of the Ming - somewhat like the layered meaning of Shostakovitch's symphonies under Stalin. Particularly startling is the deliberately distorted calligraphy of Fu Shan. His 'Running Cursive' (c.1682) renders the phrase "The 76-year old man Fu Shan wrote in a small garden beneath willows" almost illegible with wild flourishes and loops, now seen as a protest in purely formal terms - described as "mad-cursive" in the catalogue - and, given the context, as avant-garde as anything I've seen recently. The final room reflects on the rich layering of meaning in much Chinese work, with the language's many homophones deployed in elaborate visual puns. Actually, our word 'pun' almost devalues the beauty of these constructions, in both linguistic and visual form. For instance a particularly vivid work, 'Ten Thousand Blessings to the Emperor', depicts a cloud of black and red bats descending on a glade of ancient pine trees. With the bat (fu) as a homonym for blessings (also fu); and given the red colour (joyful, warding off malevolent spirits) and the pine trees (representing longevity), this becomes an elaborate birthday card for the Emperor. Overall, these are brief personal highlights from what is probably the single greatest collection of historically significant artistic work I've ever seen. The exhibition runs in London for months (until April 2006) and will hopefully travel thereafter. Do see it if you can. "Every Sunday his father would take him to Genoa's harbour and Piano would watch the ships, which he thought of as "immense buildings that move". When they sailed, he watched them cross the water and imagined that they were flying. These notions converged in his mind to form an idea of buildings as structures that "fought against gravity", as "miracles". What he calls his "obsession with lightness" - lightness as both a physical and an emotional property - comes from these experiences. Piano describes Genoa as "the austere version of Venice - Venice is the city of extroversion and Genoa the city of introversion" - and says he carries the memory of it in his "skin"." "Piano's other great linchpin is his optimism, which he relates to the experience of growing up during the postwar reconstruction, particularly since his father was so intimately involved in it. This was not architecture as decoration, or art, but as a solid, practical, desperately needed provision for Italy's poorest families. "I learned that, day by day, you make a better street, a better road, a better walkway, better houses, better something." Of course, he says, memories of the war fade, "but your chromosomes remember". He believes in progress; the idea that "time gives humanity the possibility to run away from tragedy. That makes a lot of sense." And so the foundations upon which he built his career were laid. He is not romantic about human nature, however. When he talks about progress, he is careful to separate technological advance from, say, "ethics", which he says, smiling wryly, show no signs of improving." "The big topic of today, and of the next 20 years, will be peripheries. How you can transform peripheries into a town. What is happening today in Paris is happening everywhere. It is mad, mad, and the insensitivity of people and politicians . . . They create ghettos. In Paris it is particularly bad. Now people are starting to understand that the real challenge of the next 30 years is to turn peripheries into cities. The peripheries are the cities that will be. Or not. Or will never be." "The mistake, he says, has been a conceptual one. France's politicians have failed to understand that for a community to work, it cannot be a "ghetto"; it must be a place in which people work, and sleep, and socialise and, most importantly, "merge" in some way." "He says ghettoes are "against the idea of a city. Cities are a place of tolerance, by definition, where difference must merge. It's tragically predictable, what happened, and it will probably happen again if something isn't done. It is also because of the government; these people don't understand the important of tolerance." He is not naive enough to believe that his field of endeavour can fix this. But does he believe that architecture can help build that tolerance? "Architecture in some way has the duty to suggest behaviour. In some way. Places are the portrait of communities, and if the place is impossible, the community becomes impossible."